I had perfectly sweet, perfectly ripe blueberries for breakfast this morning, which made me think of this pie. I think the flavors and textures of blueberries and peaches are very complementary. 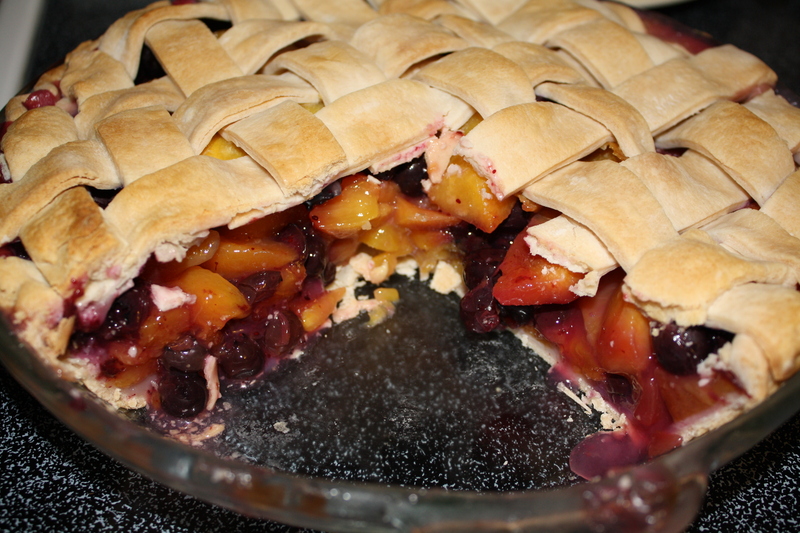 I prefer the blueberry-peach combination over an all berry pie. There isn’t a lot of sugar in this pie – the recipe relies on the natural sweetness of the fruit, brought out by bright, citrusy lemon juice. 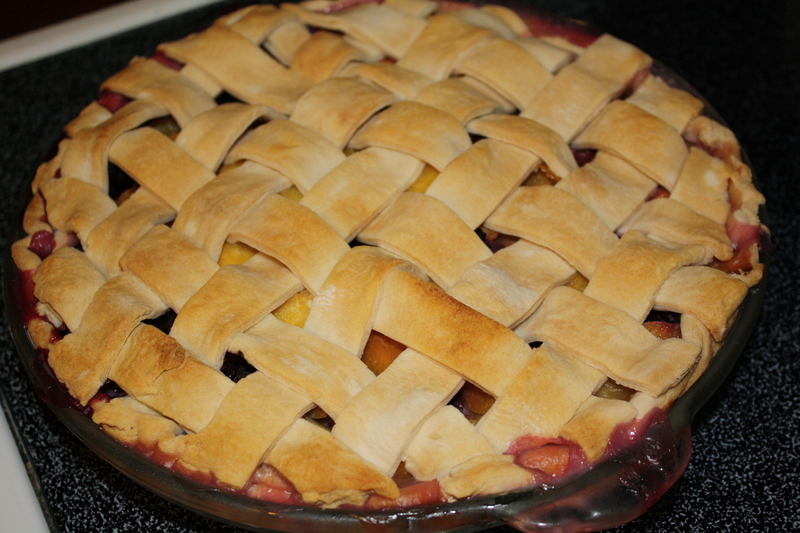 This creation was pretty easy to whip up but the lattice top makes it look like I spent forever in the kitchen. 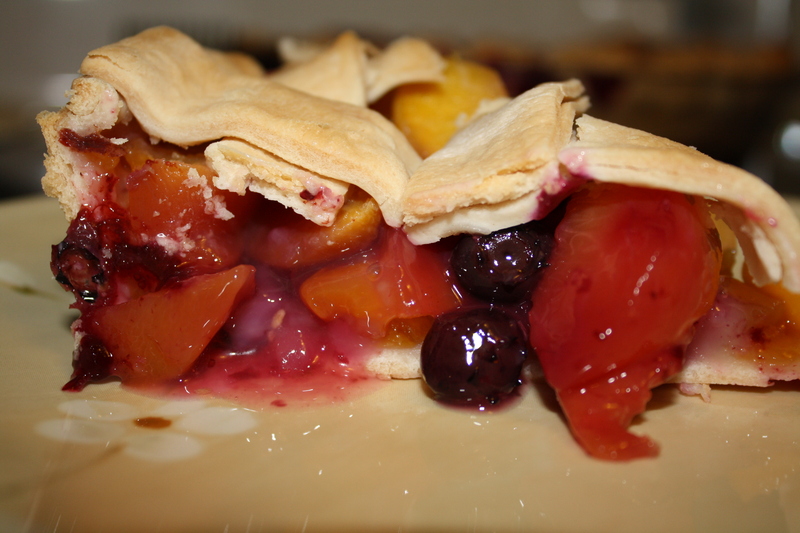 While you could use fresh peaches or make your own pie crust, my shortcuts get me in and out of the kitchen in no time, which makes this a great dessert for a lazy summer weekend. For this pie, I used a package of store-bought pie crusts: one was used for the bottom and the other was rolled out and cut into strips to make the lattice (for help with your lattice crust, check out this website: Simply Recipes.). If I’m feeling industrious, I make my own crust but in the middle of the summer when it is 100 degrees outside I’ll take the help from the grocery store. Frozen peaches hold up better than frozen blueberries, which makes frozen peaches a great substitute when I can’t find ripe, fresh peaches or I don’t feel like blanching and peeling two pounds of peaches. Line a 9-inch pie pan with one pie crust. In a bowl, gently combine blueberries, peaches, lemon juice, sugar, cornstarch, and salt (if you mix this together too vigorously, you will smash the blueberries). Spoon the fruit mixture into the pie crust. Dot the fruit with small pats of butter. Using the second crust, create a lattice top on the pie. Wrap the edges of the pie with aluminum foil so they don’t burn. Bake at 350 for 35 to 40 minutes or until the crust is golden brown. and the fruit is bubbly. Allow to cool for 20 – 25 minutes. Serve with vanilla ice cream or whipped cream. That pie looks heavenly. I’m making it next week! I’m glad you like it! Let me know how it turns out!